With the need for healthcare providers to be more accessible to patients, more and more providers are moving to convenient locations. A perfect example of this is the new Fairview clinic located inside a new retail center Eagan, a move made possible by the Davis Group. Central Park Commons is a new development that consists primarily of retail stores and restaurants. In an effort to make healthcare more convenient, Fairview will provide medical care inside the facility right alongside a grocery store, apparel retailers, and several restaurants. 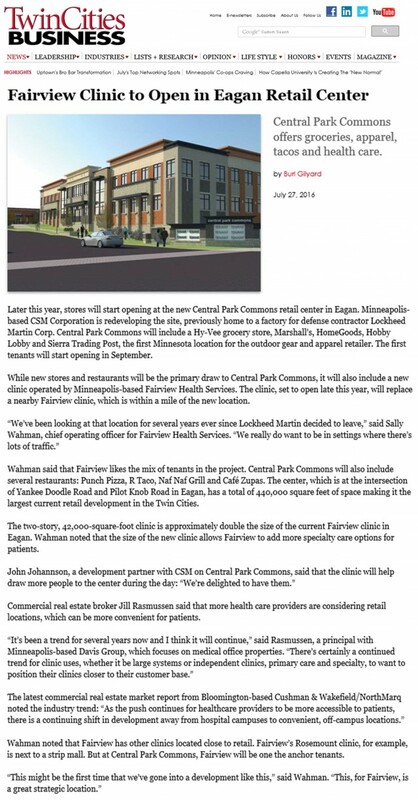 The two-story, 42,000 SF clinic is approximately twice the size of the current Fairview clinic in Eagan. Fairview will be one of the anchor tenants in the facility, an opportunity the healthcare provider views as a great strategic location.